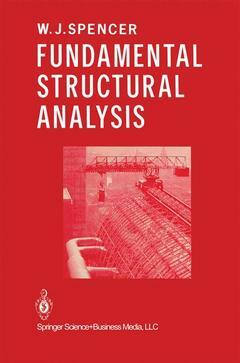 Fundamental Structural Analysis SPENCER W.
Significant changes have occurred in the approach to structural analysis over the last twenty years. These changes have been brought about by a more general understanding of the nature of the problem and the develop­ ment of the digital computer. Almost all s~ructural engineering offices throughout the world would now have access to some form of digital computer, ranging from hand-held programmable calculators through to the largest machines available. Powerful microcomputers are also widely available and many engineers and students have personal computers as a general aid to their work. Problems in structural analysis have now been formulated in such a way that the solution is available through the use of the computer, largely by what is known as matrix methods of structural analysis. It is interesting to note that such methods do not put forward new theories in structural analysis, rather they are a restatement of classical theory in a manner that can be directly related to the computer. This book begins with the premise that most structural analysis will be done on a computer. This is not to say that a fundamental understanding of structural behaviour is not presented or that only computer-based tech­ niques are given. Indeed, the reverse is true. Understanding structural behaviour is an underlying theme and many solution techniques suitable for hand computation, such as moment distribution, are retained. The most widely used method of computer-based structural analysis is the matrix stiffness method. 1 Introduction to Structural Engineering.- 2 Equilibrium Analysis and Determinacy of Structures.- 3 Basic Concepts of the Stiffness Method.- 4 The Matrix Stiffness Method—Part 1: Beams and Rectangular Frames.- 5 The Moment Distribution Method.- 6 The Matrix Stiffness Method—Part 2: Coordinate Transformation.- 7 The Principle of Virtual Work.- 8 The Flexibility Method of Analysis.- 9 The Approximate Analysis of Structures.- 10 Application of Computer Programs to Structural Analysis.- Appendix A: MATOP (Matrix Operations Program)—User Manual.- A.1 Introduction.- A.2 Form of the Program.- A.3 Operation of the Program.- A.4 The Command Formats.- A.5 An Example of the Use of the Program—Solution of Simultaneous Equations.- A.6 Listing of the Program MATOP.- Appendix B: Structural Mechanics Students’ Handbook—A Manual of Useful Data and Information.- 1.- B1.1 Introduction—Convention.- Table B1.2 Some properties of area.- Table B1.4 Beam end rotations under transverse load.- Table B1.5 Standard integrals relating to moment diagrams.- Table B1.6 Second moments of area.- B1.2 Summary of the Slope-Deflection Equations.- B1.3 Use of Table B1.4—Fixed End Moment Calculation.- 2.- B2.1 Introduction—Convention.- B2.2 Continuous Beam Element.- B2.3 Continuous Beam Element—LHE-pinned (Moment Release).- B2.4 Continuous Beam Element—RHE-pinned (Moment Release).- B2.5 Column Element.- B2.6 Column Element—Base-pinned.- B2.7 General Plane Frame Element.- B2.8 Plane Grid Element.- B2.9 Space Frame Element.- Reference.